Beirut (Agenzia Fides) - A possible Lebanese "national unity" government must necessarily "group all the Lebanese political forces", and not just divide the ministries among the political forces that won the elections. This is what Maronite Patriarch Bechara Boutros Rai stressed on Sunday, October 29, questioned by the Lebanese media on his return from a pastoral trip to Canada about the formation of a new Lebanese executive led by designated Premier Saad Hariri. 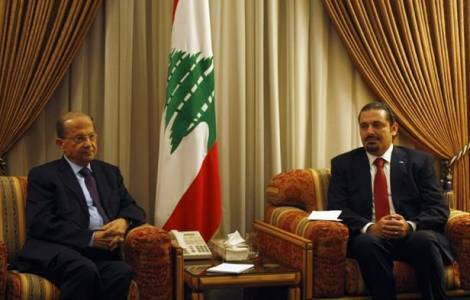 According to rumors and analyzes re-launched by the Lebanese media, the new government should have the backing of all the most consistent political formations, including the Hezbollah Shiite Party, even if the involvement of Lebanese Forces led by Samir Geagea appears uncertain. Patriarch Rai, responding to the journalists who awaited him at Beirut airport, insisted that a national unity government, to be such, must have a broad parliamentary consensus, which goes beyond the logic of the privileged axes between political forces of greater political weight. "What do we do", among other things, highlighted the Patriarch "with 51% of the population that did not take part in the elections? They represent half of the Lebanese population. Don’t they have the right to participate in the government?". According to the Maronite Patriarch, a government of national unity can only take shape if all political forces in Lebanon support it "because the Country needs the help of all its children". The US sanctions imposed against Hezbollah by the US administration came to interfere partially in the negotiations for the formation of the new Lebanese government. These economic sanctions do not only affect affiliates of the pro-Iranian Shiite Party, but every other person involved in cooperative relations with Hezbollah.